Seven years ago exactly I stepped onto a magical island unheard of by most young Americans like me. Bali was a land a world away, where the people were warm, the food was delicious, and monkeys entertained tourist. All of these things are still true, including the monkey part. While traveling Ubud I knew I had to make to Ubud’s Monkey Forest, and thoroughly enjoyed the experience. 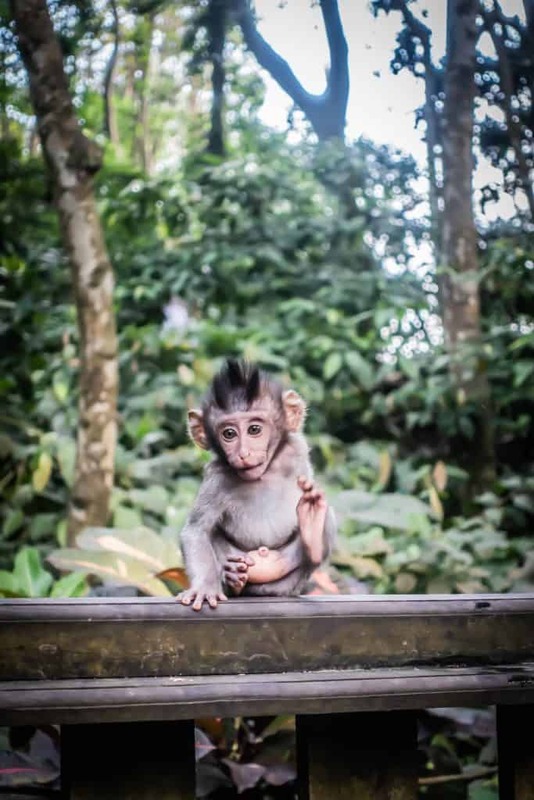 When I finally brought Cameron back to Bali in 2018 I figured we should give Ubud’s Monkey Forest another go and see just how much had changed and how he liked it. Sure, along with everything else in Bali the price has risen and the sanctuary is more built up, but the monkeys remain their mischievous selves. Monkey Forest can be hit or miss for most people. Either you love it or you hate it. Even though we’ve gone gorilla trekking in Uganda and chimp trekking in Rwanda, we still found the monkey forest in Bali to be a fun thing to do if you have an hour or so to kill. 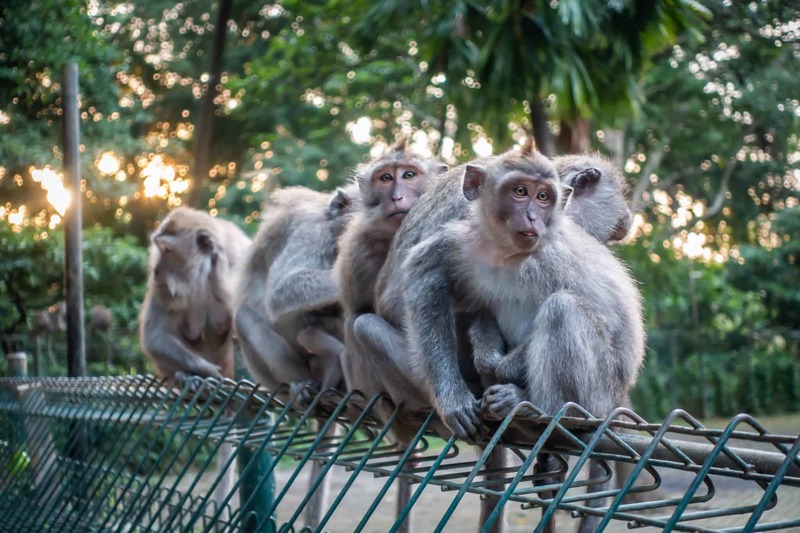 If you find yourself curious about the monkeys of Bali and venture into Ubud’s Monkey sanctuary here are some things you should know. 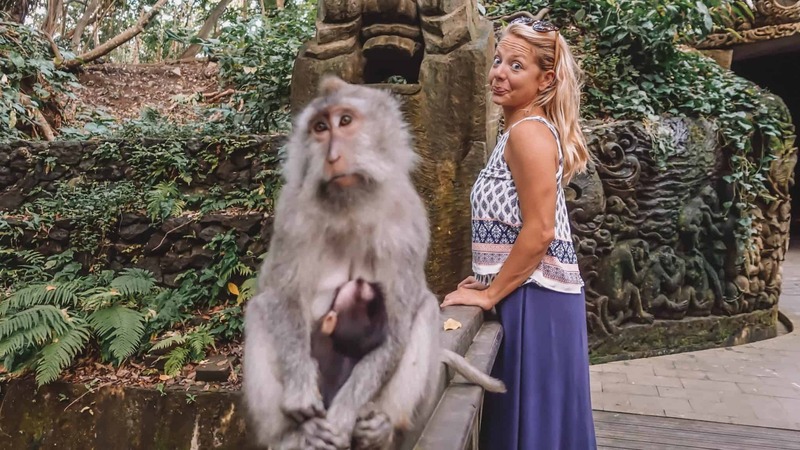 This should be obvious, but both times that I’ve visited Ubud’s Monkey Forest I have seen tourists deliberately trying to touch the monkeys. The monkeys, especially the young ones, are pretty darn cute. They are tame and used to humans, but this doesn’t mean you should touch them! Not only is it affecting their behavior, but it’s downright dangerous. Monkeys are unpredictable and have razor-sharp teeth. One wrong move and you could have a couple fangs in you on your way to diseases, an Indonesian hospital, and a few rabies jabs. Just don’t put yourself in that kind of risk. 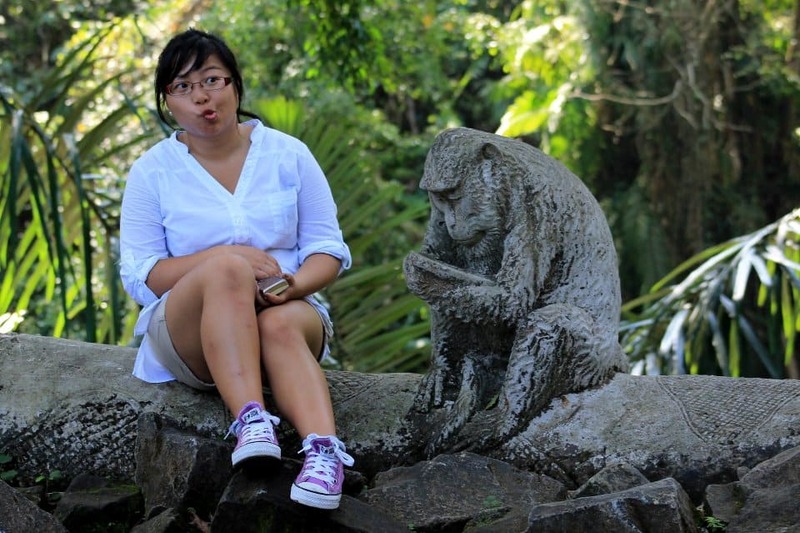 Me at the Monkey Forest seven years ago. Thankfully I have wisened up since then. Don’t be me. You’ll see signs up all over informing you not to look a monkey in the eye. Like many animals looking them in the eye means that you are challenging them. Don’t be fooled as the monkeys are quick and athletic and can jump on you faster than you will be able to realize what is even going on. Looking them in the eye for even just a second can provoke them. Feel free to makes eyes at them when they’re not looking! I would allocate at least an hour to enjoy the full sanctuary and observe the monkeys. We arrived before closing time and were ushered out 15 minutes before six. We stayed for a grand total of 30 minutes in the sanctuary and I thought we could have used at least another 30 minutes inside. 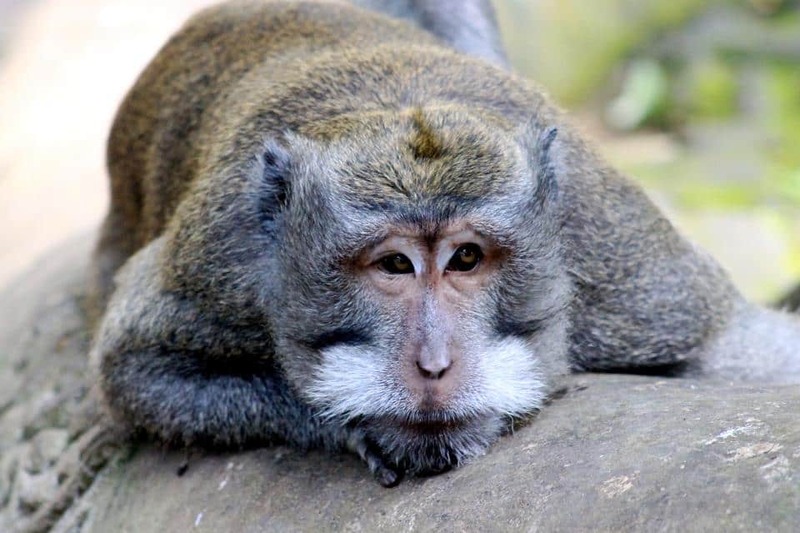 The Ubud Monkey Forest official opening hours are 8:30am-6:00pm daily. What’s the Ubud monkey forest price? Seven years ago when I visited I remember the cost to visit Ubud’s monkey forest was equivalent to $2. Over the years the cost has risen and you will need to pay 50,000 IDR (about $3.50) in cash to enter the temple. It’s $3.50 well spent and I can tell that it has gone to the upkeep of the temple and the well being of staff. The monkeys, pathways, and signs all seem to be well cared for and it’s a lovely forest. My first time in Bali I saw a woman with reading glasses enjoying her vacation. In the blink of an eye, a monkey jumped on her shoulders, stole her glasses, and skedaddled off never to be seen again. Monkeys are interesting creatures as they are so humanlike and have little fingers and toes like we do. That means they can easily steal your loose items and run off with them. My bets are on the monkey if you even attempt to get them back. Once they have what they want they won’t give them up without a fight or until they lose interest. It used to be that you could buy bananas and other snacks from local vendors to feed the monkeys at the Ubud monkey forest. On our recent trip we didn’t see this anymore and I believe they have stopped the practice. Don’t bring your own food in either. Food from humans can make the monkeys more aggressive and you are only subjecting yourself to monkey harassing. Trust me, you will be able to get close enough to the monkeys without the help of food. What to wear to the monkey forest? Keep in mind that the Ubud Monkey Forest is named “The Sacred Monkey Forest Sanctuary” and is still very much considered sacred. There are three temples here that were built in the 14th century, so aside from seeing the monkeys, you will be able to see ancient temples. The monkey forest Ubud dress code should be considered before visiting the ancient temples. Unlike other temples in Asia, no one will be there to monitor your dress choices, but you can do it yourself. Avoid short skirts, too much leg, belly shirts, or excessive cleavage. Also watch our for loose articles of clothing as we watched one monkey nearly rip the dress off an unsuspecting girl. 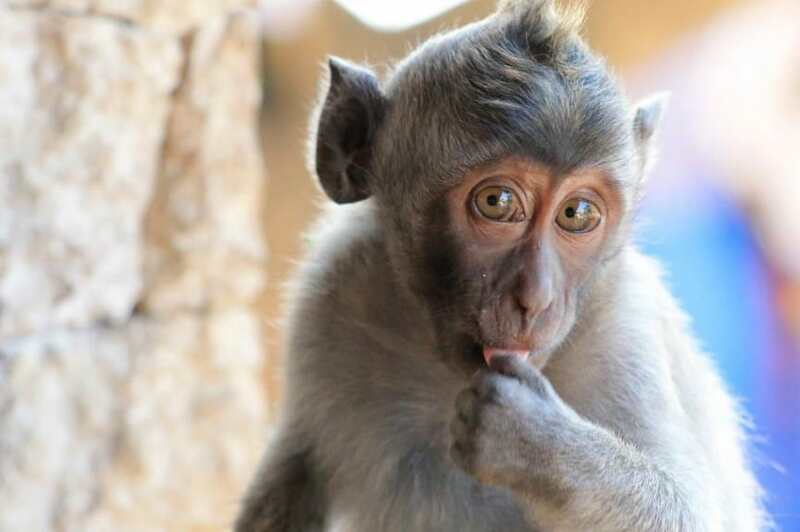 The 800 or so monkeys that inhabit the Sacred Monkey Forest Sanctuary are long tail macaques. In the Monkey Forest Ubud, the monkeys are fed sweet potato three times a day (so there really is no need to give them food). You will see many males, females, juveniles, and infants here and they are all enjoyable to observe. 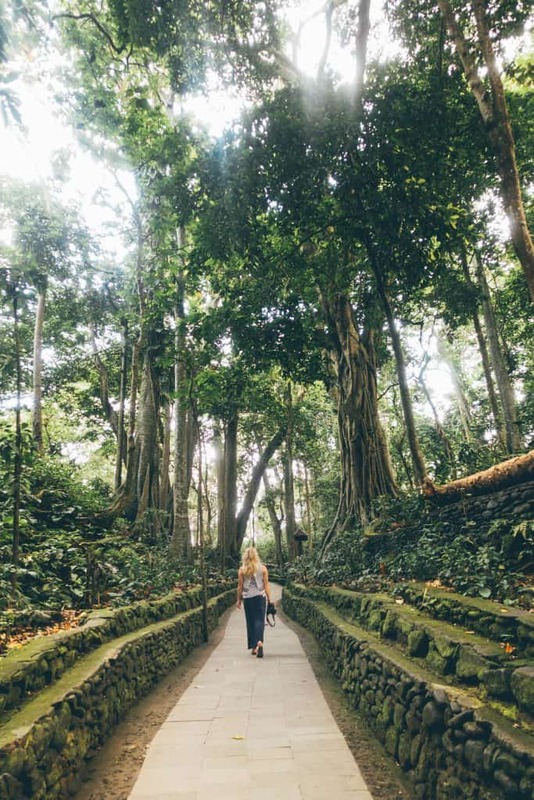 The Monkey Forest Ubud purpose is to mix nature, peace, and harmony in the heart of Ubud. 115 species of trees have been identified here with many considered holy to the Balinese. Aside from being open to visitors, Ubud Monkey Forest is also a center for research and institutions to study monkey’s social behaviors. Bring your travel camera so you can snap a photo of the Balinese monkey. We didn’t want to bring anything big or flashy with us to the monkey forest so we just stuck our Sony RX100v in our pocket and that was great to photograph and video. Be sure to turn off the flash! 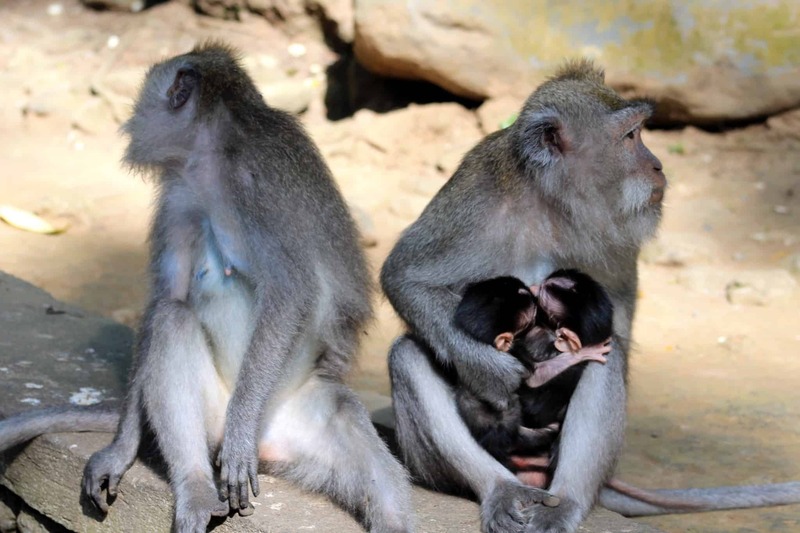 The probability of getting bit or rabies in the Ubud monkey forest is low. However if you do get nipped by a monkey don’t panic. Inform the staff and seek medical attention, there is a First Aid clinic on site for those bitten by the monkeys. Don’t do nothing. Even though the Monkey Forest website says all their monkeys are healthy I personally wouldn’t take any chances with my life or potential diseases. These are wild animals that are unpredictable. Make sure you have travel insurance before your trip to Bali. I’m not trying to scare you though. 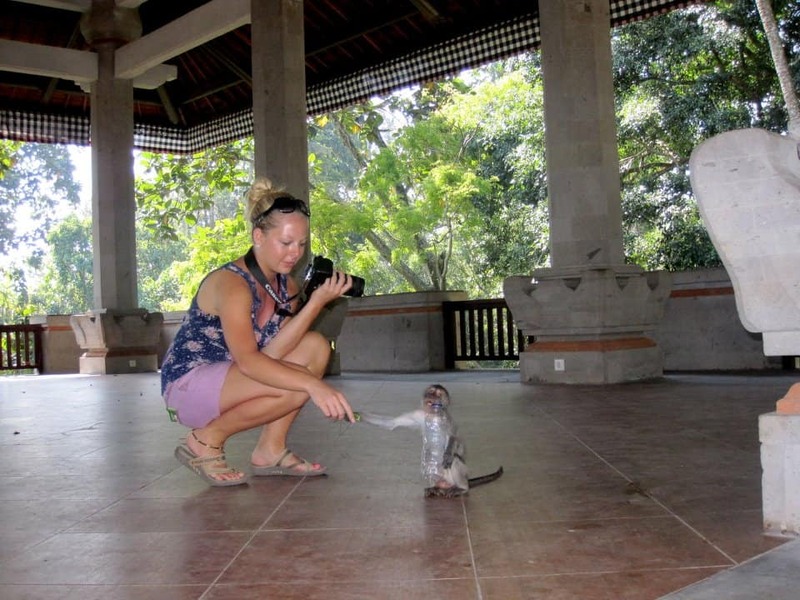 If you follow all the rules it’s unlikely that you will have anything but an enjoyable time at the Ubud Monkey Forest. Accommodation in Bali: We chose to stay in Airbnb’s around Bali. Read more about choosing a good Airbnb here. Here is a coupon for your first stay with Airbnb! Rent a motorbike: Mopeds can be had around Ubud for 60,000 IDR a day. They will require some confident driving skills though. Water: The water in Bali is not safe to drink. Save money and plastic by getting yourself a refillable Lifestraw Go Waterbottle and refill it from large liters of water. Adapter: Remember that Indonesia uses the Type C or F power adaptor. Many adapters are interchangeable, so make sure you find a good one like the one I have to keep you charged.